A police operation in the Maré favela. 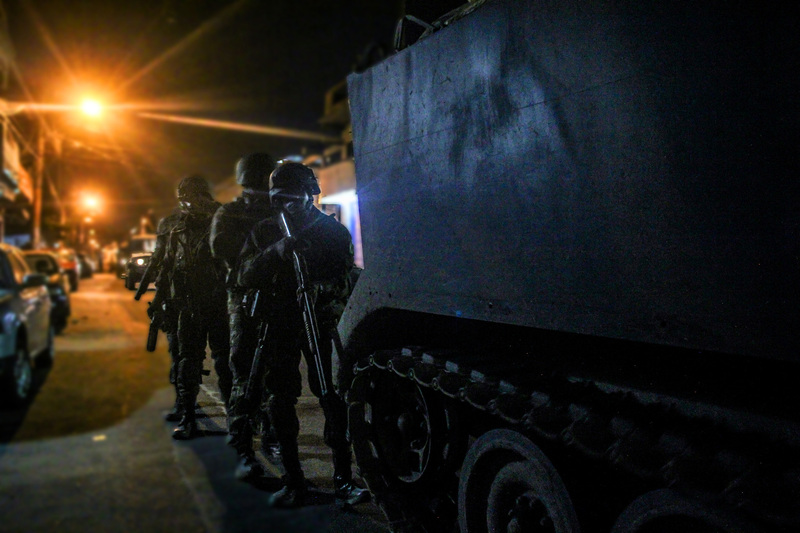 Since February, a federal decree has placed the city’s security in the hands of the military. Photo by Midía NINJA |Creative Commons. Three images dominate the entrance to the home of Father Jim Crowe on the outskirts of São Paulo: India’s Mahatma Gandhi, the Argentine/Cuban revolutionary Che Guevara, and Brazil’s own Dom Hélder Câmara, the now-deceased Archbishop of Recife who famously said “When I feed the hungry, they call me a saint. When I ask why people are hungry, they call me a Communist”. 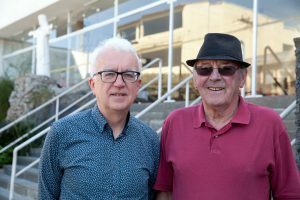 Now seventy-two years old and just recently retired from his seven-a-side football team, Jim has been in Brazil for over forty oppressive and tumultuous years. A key national political figure, he remains a committed priest and pastor in his community. He is also an active member of Brazil’s Workers’ Party (Partido Trabalhista – PT), a left-wing party founded in opposition to the misrule of Brazil’s military dictatorship. To Jim, street and protest politics are as important as his church-based ministry. Peadar King (left) with Fr Jim Crow (right). Photo republished with permission. Days before we arrived, the pipe-smoking septuagenarian entertained former president Luiz Inácio Lula da Silva in his kitchen. 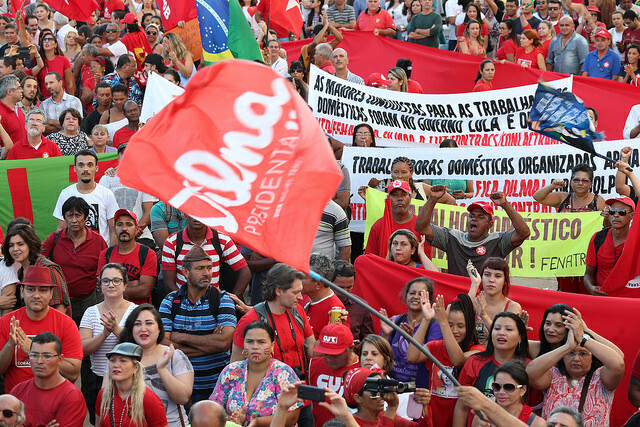 Both men have worked closely together, through their early involvement in the trade union movement up to Lula’s election as President of Brazil. 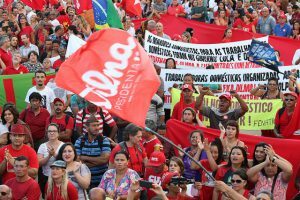 And notwithstanding the former president’s convictions for corruption, Jim will again publicly declare for Lula and the Workers’ Party in the 2018 presidential election, defying what he regards as the political right’s trumped-up convictions and their 2016 parliamentary coup against his successor, Dilma Rousseff. For now at least, the political right is in the ascendency. And nowhere is this more visible than in the area of policing. Brazil is a society that is being torn apart by violence. 56,000 people were killed in 2012, a violence that permeates all life in the country and has since increased markedly. In 2012 more than 50% of homicide victims were aged between 15 and 29 (30,000 in total). 90% were men and 77% of them were black. Yet rather than controlling the violence, the police fuel it. Their targets for the most part, are the three P’s: Pobre (Poor), Preto (Black), and Periférical (of the periphery). Thousands of ordinary Brazilians fill the streets of Brasília to protest the impeachment of President Dilma Rousseff in August 2016. Photo by Lula Marques/Agência PT|Creative Commons. When we visited Brazil to film our documentary, we heard the stories of fifteen people, all of whom had experienced police violence. With tears rolling down his cheeks, Amaro José da Silva told us of the death of his son, killed by police. Zilda Maria de Paula refuses to cry – in public at least. It’s her act of defiance. But it is a difficult act to maintain as she recounts how the police sprayed bullets into a bar where her only son was drinking – killing ten people. Ten people killed. In a bar. Without provocation. As if that would be a justification. And no recourse to justice. And then the young people. Routine beatings. Racial abuse. Psychological abuse. Sexual abuse. Planting of evidence. One young man hobbled in to meet us, his leg in a cast, broken by police. A photojournalist, his leg marked by a rubber bullet. Yet while it is utterly shocking, there is a pattern to the abuse. Young men – and it is mostly men – are portrayed as threats, “baskets of deplorables” to borrow a phrase from Hillary Clinton. The police can focus on any detail to find a justification for their suspicion – hoodies, baseball caps, shorts that come below the knee or any logoed t-shirt are enough to make a young black man a target. If driving while black makes you a target in the United States, dressed while black makes you a target here in Brazil. It’s not as if the favelas do not have enough violence already. One mother told us her son was killed while he attempted to rob a bank. It was a shoot to kill. The evidence showed that he was lying on the ground at the time, when he was shot by a security guard who was actually a policeman on a nixer. But in a country mired in corruption, for a poor person to rob a bank is almost the natural thing to do – after all, it pales in comparison to some of the schemes Brazil’s elite run. Except their lives are not at risk. They are never shot dead. Current President, Michel Temer, is just one example. In June, the Prosecutor General, Rodrigo Janot, charged Temer with corruption, arguing that $150,000 found in a suitcase was destined for him and another $12m was due. Despite the charge and 5% approval rating, in defense of their own class interests the Congress has continued to back Temer. It’s as if they are inverting another of Dom Hélder Câmara’s aphorisms, from “We must work not just for the poor, but with the poor” to “We must work not just with the rich but for the rich”. Well might Jim Crowe, as he refills his pipe yet again, invoke the spirit of the Marxist Che Guevara. Peadar King is the presenter/producer of the long running RTÉ global affairs series What in the World?. He can be contacted at peadarking1@gmail.com.